Sir Plus is what’s known in colloquial terms as ‘a clever one’. Even the name of the company is clever. Its clever because the spelling of said name alludes both to that which is classically British; the honour of knighthood – a concept which brings with it associations of integrity and reliability – and also that which is surplus to requirements. Using that which is surplus to requirements is Sir Plus’s business and damn good they are at it too. The firm was the brainchild of the ever excitable Henry Hales – an ambitious and business savvy graduate with a penchant for the sartorial, who started the process of producing and retailing top quality British boxer shorts from recycled materials a couple of years ago. The firm has since grown to produce luxury British products with both ethical integrity and real quality of manufacture. Initially however, things looked rather tricky. Hales quickly discovered that the cost of printing high quality cloths for his boxers was prohibitive. Undeterred, Hales used his initiative and began scouting for top-quality surplus off-cuts and individual cut-lengths of cloth, which could be employed in the creation of Sir Plus’s quintessentially British undergarments. Hence the firm’s obsession with ‘cabbage’, this being the industry’s slang for surplus off-cuts of cloth. All Sir Plus’s cloths are ‘cabbage’ – pieces lovingly sourced from heritage rich tailors and fabric dealers in the UK and the tailoring capitals of Europe, a strategy which minimises waste within the luxury menswear industry and which creates truly original and quirky products in the process. The brand currently produces boxer shorts, scarves, pocket squares, waistcoats and some rather splendid Nehru jackets. All Sir Plus products are made in the UK – an admirable and brave decision given the expense that this often incurs. Rest assured however, the quality of Sir Plus’s products truly does shine through. 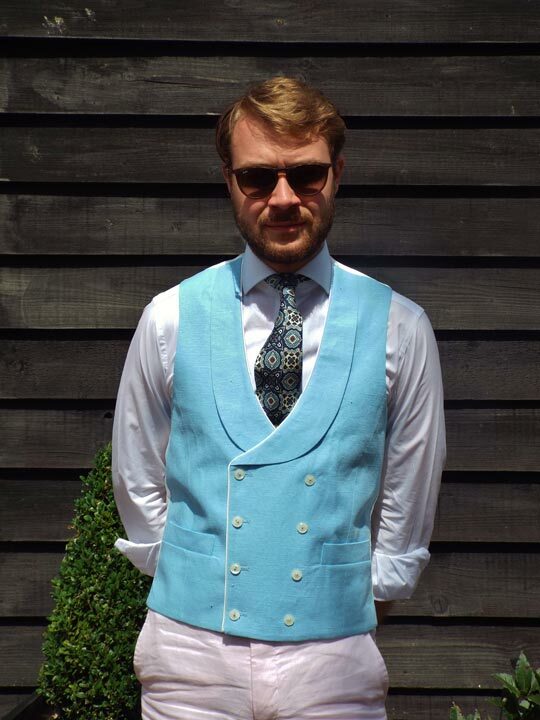 The sky blue linen double-breasted waistcoat pictured is a Sir Plus piece. The Irish linen ‘cabbage’ from which the waistcoat is fashioned is dense, tightly woven and has real body. The ivory lining compliments the warm, light blue beautifully and likewise feels substantial and crisp, as do the cream buttons and piping. I also very much like the eight by eight closure, and sweeping full-darts not often seen. 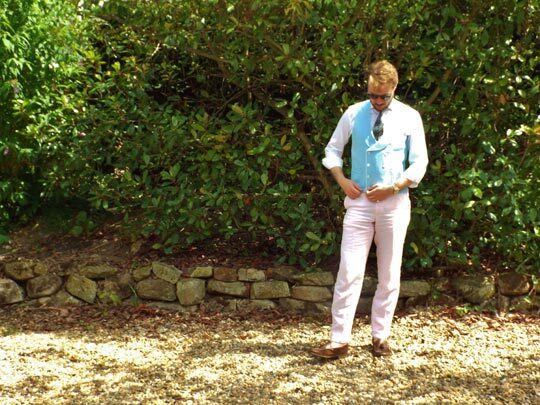 The waistcoat is unusually long, but this allows for the waistcoat to sit cleanly over the waistbands of even the lowest cut modern trousers – this practicality being something I’m sure many readers will welcome. All in all, its a lovely thing – and its appeal is helped in no small measure by the fact that its been handmade in Britain. Holly Purchase, Sir Plus’s PR & Marketing Manager makes the point perfectly: ‘Customers can feel a real pride in wearing British garments which contribute to the creation of a uniquely British wardrobe. In addition to the benefits of buying and wearing high quality garments that are made in the UK, customers lessen environmental impact and contribute positively to our economy’. There can be no doubt then, that behind Sir Plus’s attractive eccentricity, (for anyone doubting this – please do see the rather witty video below) lies an engaging obsession for creating products which are both truly original, luxurious and quintessentially British. Aleksandar Cvetkovic is a full time student at Oxford University. He is also a self confessed dandy, tailoring enthusiast and connoisseur, looking to build a career in the menswear industry upon graduation. He blogs at thestudenttailor.blogspot.co.uk. Nice waistcoats, however there is something odd about the cut of the single breasted ones, specifically the placement of the lowest, non-buttoning button. And yes, I appreciate that it’s non-functional. I’m travelling at the moment and don’t have any of my own waistcoats with me for reference. Great quality from Sir Plus, but sadly I’ve yet to find anything from them in an XXL size, for those of us who err on the larger side (in my case I’d like to be able to purchase waistcoats suitable for a 50″ chest, thereby allowing a small amount of freedom of movement when wearing the product). Having chatted with one of their guys on their stall in Portobello Road, I was assured that there was plenty of such sizes available to order through their website. Sadly not the case for any of the items that I would happily have purchased otherwise. So sorry it has taken us so long to respond!